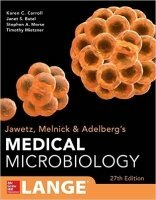 Understand the clinically important aspects of microbiology with this full-color review Includes more than 20 case studies The twenty-seventh edition of Jawetz, Melnick & Adelberg’s Medical Microbiology delivers a concise, up-to-date overview of the roles microorganisms play in human health and illness. Linking fundamental principles with the diagnosis and treatment of microbial infections, this classic text has been updated throughout to reflect the tremendous expansion of medical knowledge afforded by molecular mechanisms, advances in our understanding of microbial pathogenesis, and the discovery of novel pathogens. Along with brief descriptions of each organism, you will find vital perspectives on pathogenesis, diagnostic laboratory tests, clinical findings, treatment, and epidemiology. The book also includes an entire chapter of case studies that focuses on differential diagnosis and management of microbial infections. Here’s why Jawetz, Melnick & Adelberg’s Medical Microbiology is essential for USMLE review: 650+ USMLE-style review questions 300+ informative tables and illustrations 23 case studies to sharpen you differential diagnosis and management skills An easy-to-access list of medically important microorganisms Coverage that reflects the latest techniques in laboratory and diagnostic technologies Full-color images and micrographs Chapter-ending summaries Chapter concept checks Jawetz, Melnick & Adelberg’s Medical Microbiology introduces you to basic clinical microbiology through the fields of bacteriology, virology, mycology, and parasitology, giving you a thorough yet understandable review of the discipline.